【SIZE】Base Diameter: Approx. 10cm / 3.9inch, Top Diameter: Approx. 9cm / 3.5inch, Height: Approx. 3.7cm / 1.5inch. 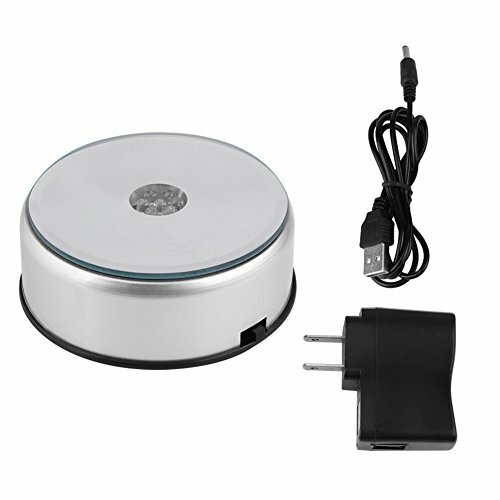 【WORKING WAYS】Rotates on battery power as well as adapter power. AC US Adapter is included. 【HIGH PERFORMANCE】The round mirror will rotates 90°, 7 Color LED lights work at the same times and brightens up any transparent object with magnificent effect! Durable to use and works great. 【COLORFUL LED DISPLAY】Colorful crystals rotating display stand,great for displaying your favorite crystal glass figurine or figurines jewelry or anything. 【WIDELY USED】Widely used in display of middle size products, plastic model , window display, solid display and superstore.